Consumers spoke and Costco listened! Costco just announced a new program to address toxic chemicals and for the first time made their actions public. The recently unveiled Smart Screening Program conducts laboratory testing of products for chemicals of “regulatory and social concern.” In addition to testing Kirkland food packaging, baby wipes and diapers, the Smart Screening Program tests seven different product categories for select chemicals of concern in those products. Product categories include clothing, furniture, cleaning and personal care products, bedding, pet beds and home goods. While this is progress, we still need to encourage them to join Target, Walmart and CVS Health in adopting a chemical policy that includes full public disclosure and clear timelines for eliminating hazardous chemicals from products. 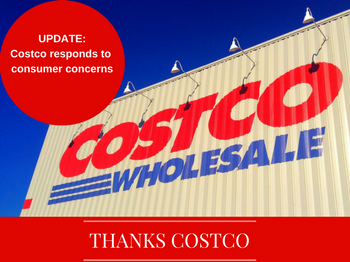 TAKE ACTION: Tell Costco thanks for listening and to continue making progress.